Explanation: Why does a volcanic eruption sometimes create lightning? Pictured above, the Sakurajima volcano in southern Japan was caught erupting early last month. Magma bubbles so hot they glow shoot away as liquid rock bursts through the Earth's surface from below. The above image is particularly notable, however, for the lightning bolts caught near the volcano's summit. Why lightning occurs even in common thunderstorms remains a topic of research, and the cause of volcanic lightning is even less clear. Surely, lightning bolts help quench areas of opposite but separated electric charges. One hypothesis holds that catapulting magma bubbles or volcanic ash are themselves electrically charged, and by their motion create these separated areas. 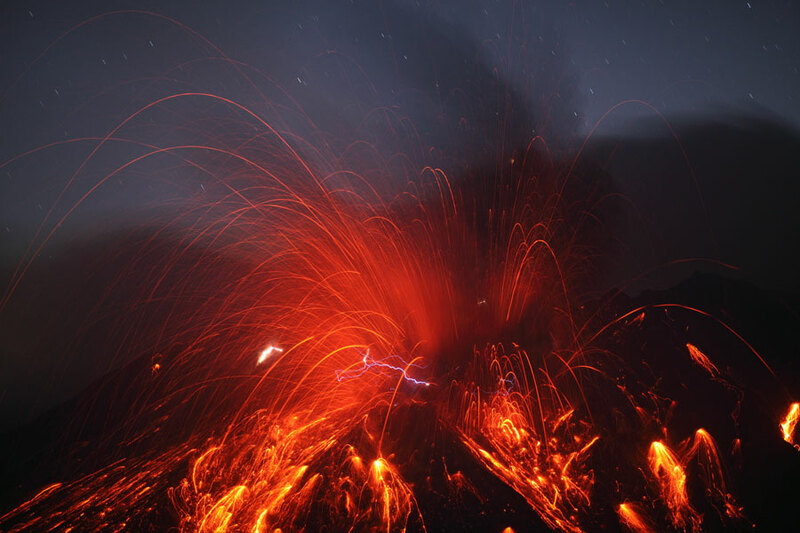 Other volcanic lightning episodes may be facilitated by charge-inducing collisions in volcanic dust. Lightning is usually occurring somewhere on Earth, typically over 40 times each second.